This item is currently available to backorder only with shipping commencing in late June. You will be charged in full upon checkout and any additional items ordered will be held to ship complete. 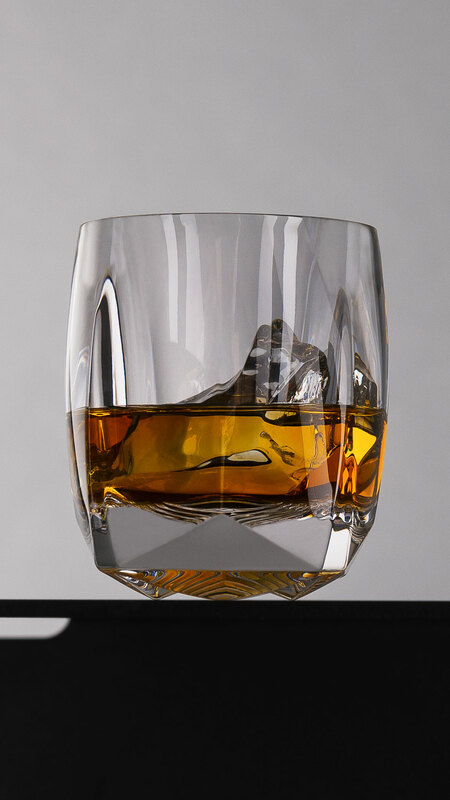 An uncompromising crystal tumbler for savoring whisky on the rocks. The Rauk Heavy Tumbler is the meeting point of advanced digital design, inventive production techniques and the intimate whisky ritual. 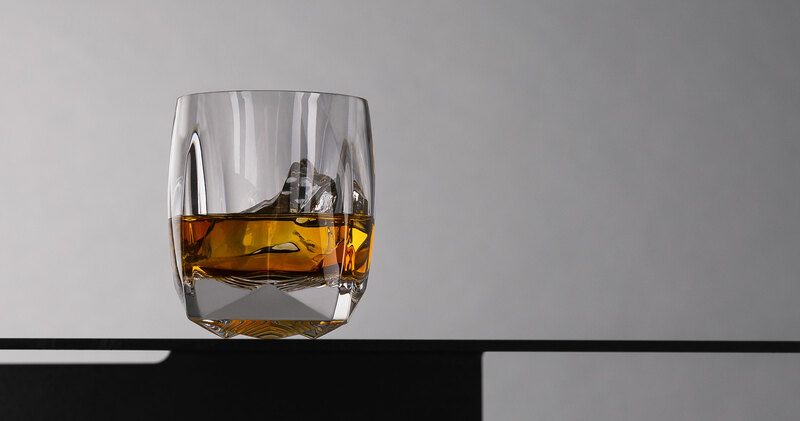 Taking its name from the Old Scottish word for “Rock,” the glass has been developed for whisky drinkers who prefer their spirit chilled, whether with an ice sphere or simply on the rocks. And for those who revel in the crafted cocktail, the tumbler features a core innovation. Inside the glass lies an array of extruded chevrons radiating from the center, which serve to provide friction points for gripping ingredients used in muddled drinks. Circumventing the ornamentation of traditional cut crystal, the entire surface of the tumbler, inside and out, is born in a single blinding moment of machine-pressing the molten crystal into a complex five-part mold. The result is a pure expression of material and form that somehow feels not of this time, with geometric facets and edges blending organically into curved surfaces that fascinate the eyes and play with the sense of touch. Total capacity: 8.5 fl. oz. Although dishwasher safe, we recommend washing and drying by hand. California requires the following notice. Proposition 65: Consuming food or beverages that have been kept or served in lead crystal products or handling products made of lead crystal will expose you to lead, a chemical known to the state of California to cause birth defects or other reproductive harm. Due to the manufacturing process, slight variations on the base of the glass may be possible. Tolerances have been set by Norlan and every glass that ships has been deemed within acceptable tolerances. Tiny bubbles the size of a pin point sometimes form in the fusing or melting process and do not affect the quality of the glass. Such slight variations are the natural results of the manufacture of pressed glass. When we set out to make this glass, we knew who we were making it for. You. The off-world galactic pilot, savoring that whisky on ice. But designing not just another rocks glass is about the perversion of form. We had to push it to excite not just you, but us. And so every element, each curve, edge, angle, and facet of this glass was meticulously considered over two years of development. You don’t spend two years making just another glass; you spend it making the absolute, nonpareil, heaviest tumbler you can. Let’s start by describing the form, the production, and the challenges of making such an object. We work from the ground up. The base of this glass is one of the most unique you’re likely to find, and not surprisingly, difficult to mass produce. Our makers in the Czech Republic pleaded with us to change it, simply allow them to “resolve the issues.” As usual… we didn’t relent. The base, precision-modelled, touches down on four crystal points, making surface contact while giving the appearance of hovering – a satellite in spirit. Naturally, we wanted the heaviest glass you own to appear to float. But glass cools at different rates depending on its thickness. As there is a dramatic difference between the thickness of the walls and the base of the tumbler, a precisely timed technique of cooling and turning must be choreographed before fire polishing the mold seams. If the glass cools too quickly the difference in thickness between the walls and base results in cracking. Cool it too slowly and the glass sinks on its feet. This process is a delicate balancing act, testing the limits of production feasibility and the benevolence of the machine-press technicians. It is a glass ballet. A pop and lock of timing and intuition to make this heavy glass hover. Turning to the sides, the triangular facets of the base evolve from the more organic, three-dimensional form that serves to elevate the glass above the table surface, to the triangular surfaces and creases that make the main outer surface—the part you want to touch with your hands. Moving upward, these iconic forms transition into the gently curving perimeter of the glass, finishing at the finely edged rim—the part you want to touch with your mouth. The Heavy Tumbler is more than simply a striking rocks glass that you reveal to impress your friends and well wishers. The inner base hosts a specially developed multi-chevron cross-shaped extrusion, engineered to grip ingredients during the muddling process. The chevrons of this specific pattern evolved through dozens of design iterations in search of an elegant and ideal form to aid in the art of cocktail making. The goal was to grab hold of the waxy and slippery peels and arrest their movement while you, the cocktail maker, muddle them back to life. The base of the Heavy Tumbler, precision-modeled, touches down on four crystal points, making surface contact while giving the appearance of hovering – a satellite in spirit. Naturally, we wanted the heaviest glass you own to appear to float. Turn the glass upside down, and the three-dimensional surface of the base reveals itself as a jewel-like compass, guiding you, fellow whisky traveler to your true north.